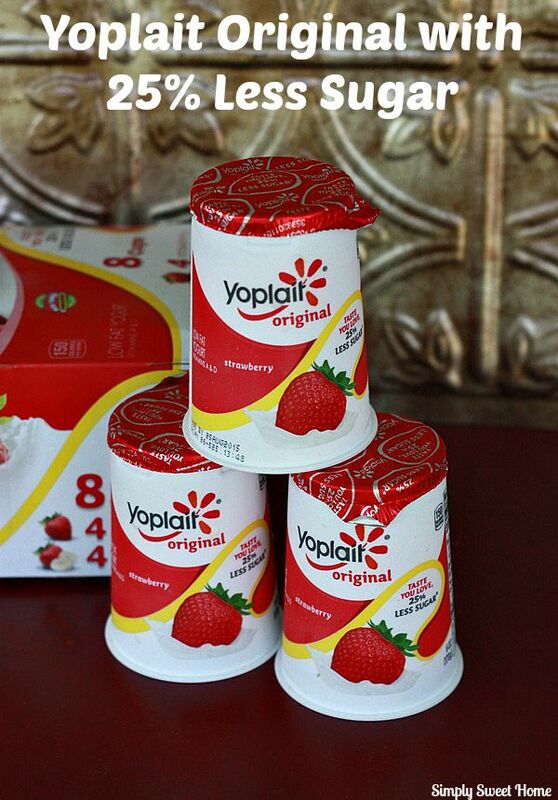 Did you know Yoplait Original Yogurt now comes with 25% less sugar? That gives you just another excuse to eat Yoplait for breakfast or your mid-morning snack or serve it to your yogurt-loving little ones as part of a complete breakfast. Yoplait Original comes in 25 flavors. I recently shopped at Publix and stocked up on some. Publix carries popular favorites– Strawberry, Blueberry and Peach, and just in time for back to school, they have a money-saving coupon. -Use yogurt as a topping/filling for pastries, pancakes, toast, crepes, and more! 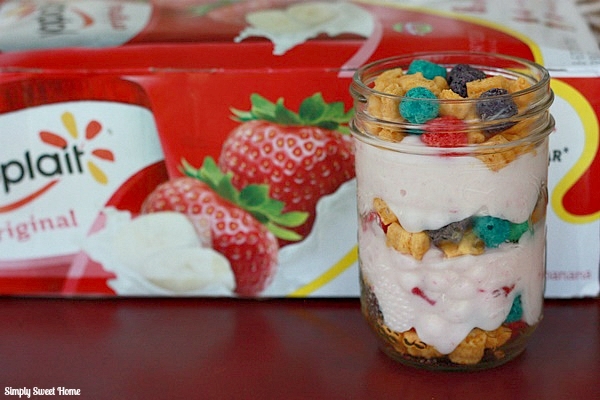 -Layer yogurt with your favorite cereals to make Yogurt & Cereal Parfaits. Check it out! 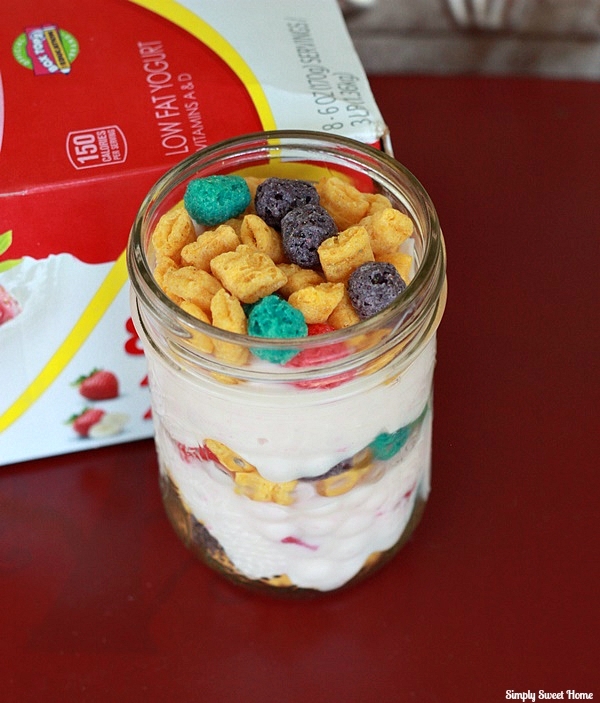 Layer cereal and yogurt in an 8 oz jar or glass. Start with cereal, followed by yogurt, then cereal, then yogurt, and finish with cereal. Easy-peasy! Place your ingredients in a cup or jar with lid for a convenient on-the-go snack! Giveaway! One Simply Sweet Home reader will win a $15 Paypal payment. To enter, use the Rafflecopter form below. My favorite flavor is Raspberry! I got the coupon for .50 off a box of Fiber One bars, and $1 coupon on 10 Yoplait yogurt coupons. My favorite flavor is the harvest peach yogurt. I like the red raspberry flavor. Oh what a fun idea with the cereal! Carter would love it! I think the first flavor I would want to try would be the Strawberry Kiwi! I really like the blueberry! Strawberry has always been a favorite of mine! My fav flav is Lemon Burst! I love the strawberry flavor. I like the traditional strawberry flavor! That looks so good! I would definitely want to try it in blueberry. That’s my favorite! I’m all for the strawberry flavor! Blueberry Yoplait is my favoeite flavor. My favorite flavor is their Black Cherry Yogurt. My favorite is the Mango flavor.